Lady Darkness is the new character and mini figure that will soon be added to the ever expanding Captain Maxx and Lady Maxx worlds. Where Lady Maxx represents the good light, Lady Darkness represents the dark light. However, it’s not all that simple as Lady Darkness emerges from the depths of Lady Maxx’s psyche ! I’m still finding my way doing pin up style work it’s not as forgiving as doing Kaiju or Monsters, where making it ugly is an advantage ! Below is the process i went through in illustrating this piece. I used acrylics on a 15 x 20 inch, Heavy Weight, Crescent watercolor board. My airbrush was a HP-B Iwata double action. 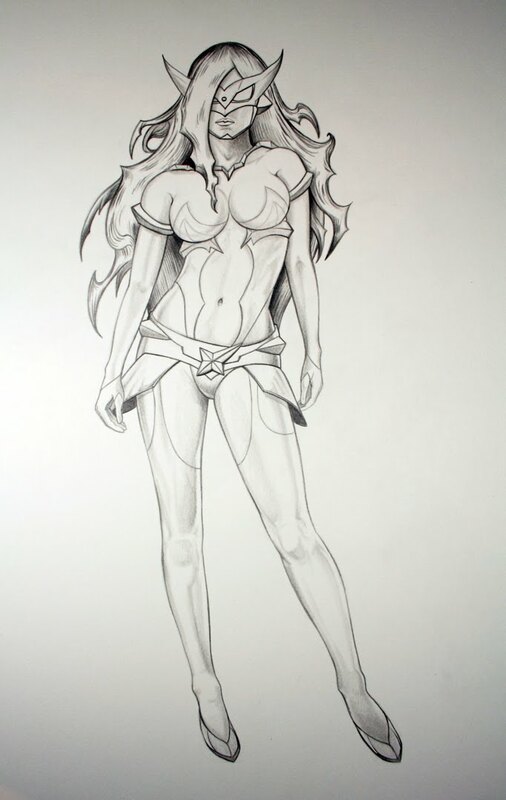 I started with a design of Lady Darkness by Yoshihiko Makino / TTToy of Japan. Makino-san has a background in designing anime type of characters. His design of Lady Maxx was spot on so it was no surprise that his rendition of Lady Darkness would be a homerun… and it is ! Using photo reference I actually photoshopped 2 different arms and altered the legs onto a body for the basic pose. 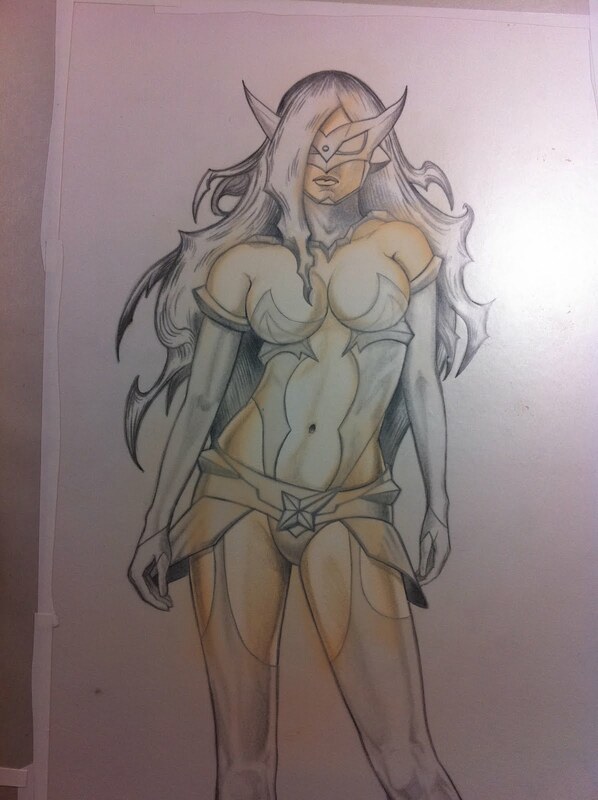 Once the basic outline was on the board I further refined the drawing .. bring in the costume design and hair elements. after the drawing was fully rendered I went back into the darker areas with a sable brush and paynes grey acrylic paints. I covered the board with Frisket Flim .. a sticky clear film that will block out certain areas I will be cutting out while painting. I use an Xacto blade #11 to cut out all the shapes .. like the legs, belt, arms etc… this part takes awhile but is needed inorder to spray each section later on. I like to think of it like a puzzle..once the pieces are cut you can pick them up spray a color and replace the piece or mask and spray another area without spraying over the color underneath. 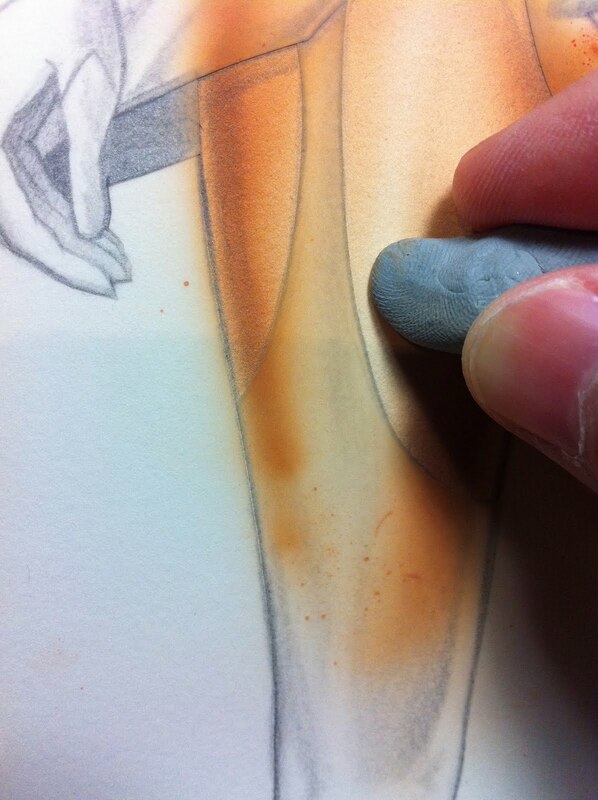 Using acrylic paints i mix up some light flesh and dark flesh .. I use both to go from light to medium to dark while spraying. Below you’ll see how i build up the colors and contrast. 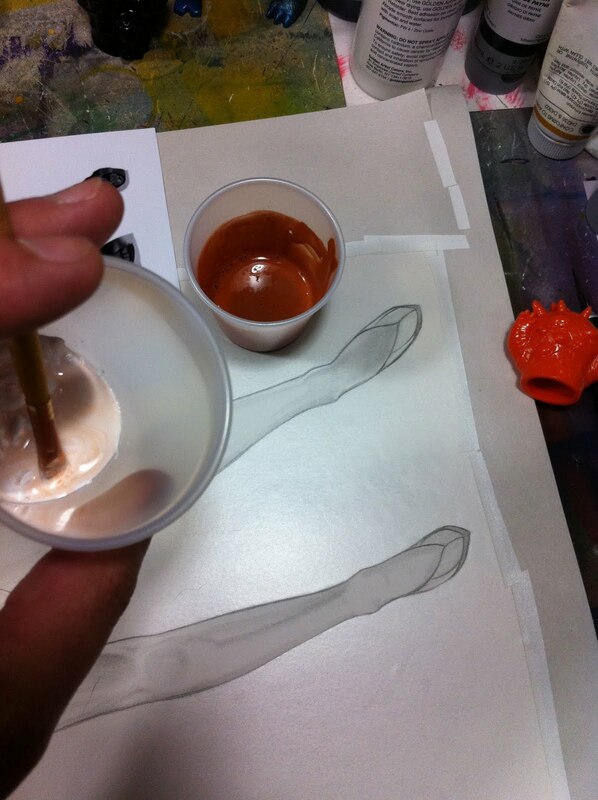 I’ll spray burnt sienna and reds as i go along as well …. however I want as much of the white of the board to come thru ..so at this stage I want to spray in light transparent layers …. nothing heavy. and here I go ! Purple … ! At this point, above, i removed all the mask to see over all how the values and working .. not too bad. The areas left open will be remasked and sprayed black. It’s far from done .. all the edges need to be worked on with a fine brush. Some parts are softened, some left as hard edges … plus the hair will be hand painted with a brush. Additional highlights will be added with gesso paint and further spraying in isolated areas as needed. Had great fun painting Lady Darkness .. and have many more ideas for Lady Darkness and Lady Maxx pin up paintings ! This entire painting took about 3-4 days. While i would have liked to have a week to complete it, like my days as an illustrator we had a deadline and I had to paint fast. Lucky for me I’m not a perfectionist ;-P while there are always areas I look at and wished i had done a better job, I look at the over all impact of any art i do and if it’s gotten the point across that i had in my mind well I’m happy and move onto the next project. It’s been over 10 years since i transitioned from full time freelance illustration to my toy company … and I’m always amazed at how what i learned during that time has lead to what i do now. I’m blessed to be able to use not only my art skills but to be able to travel around the world and meet master artists and fellow art toy fans. I hope you enjoyed looking at the process I go thru and next time I’ll post up pictures of the Lady Darkness figure 😉 which you can also see on the Max Toy web site : http://www.maxtoyco.com !